Editors Note: Joseph Lavender is a reader of Jake's Rolex World and a big fan of the Rolex Air King. 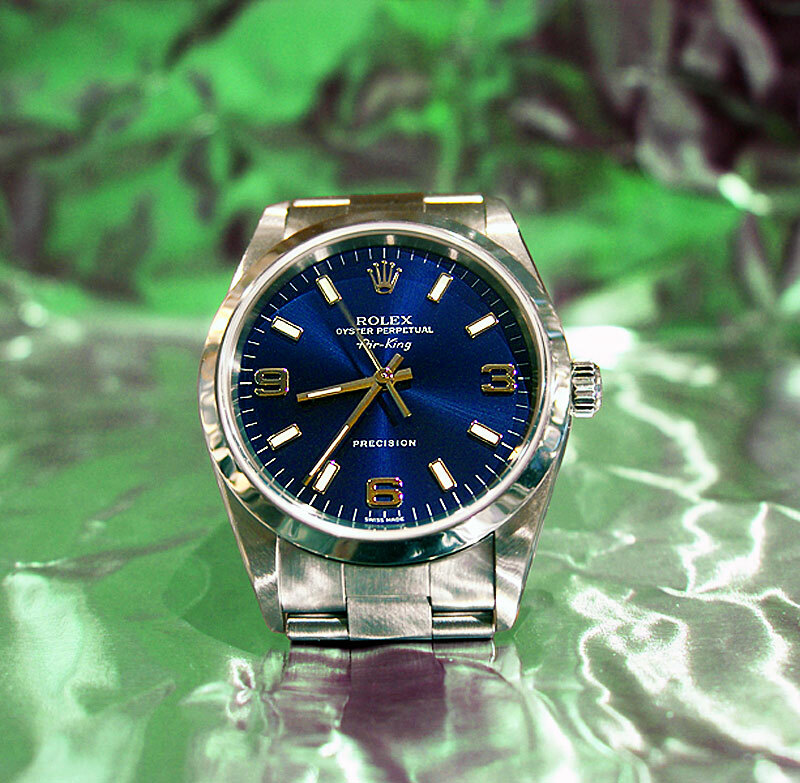 He put together this historical overview of the Rolex Air King for your reference and enjoyment. The Rolex Air-King has one of the most complex histories of any Rolex model spanning nearly 70 years of continuous production. 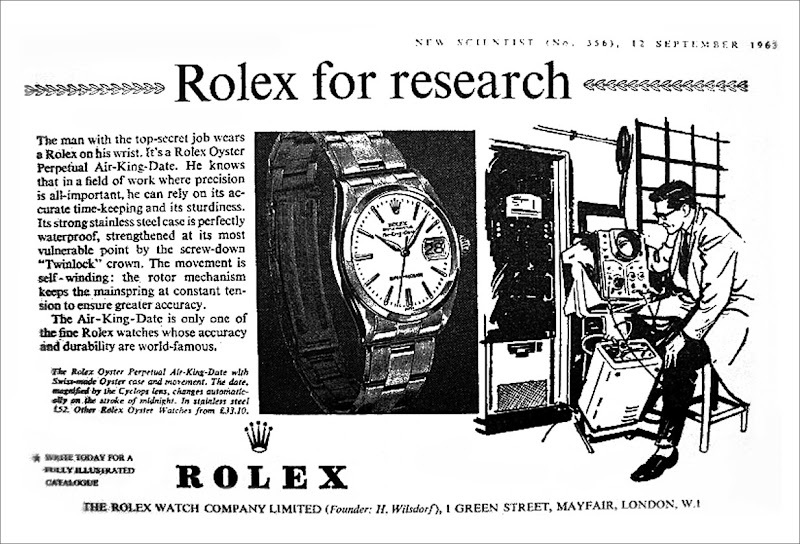 During the Second World War, Rolex would supply their SpeedKing or other specified model on credit to British POWs. As the war drew to a close, Rolex founder, Hans Wilsdorf, chose to honor the RAF pilots of the Battle of Britain with a series of aviation themed watches. The "Air" series included the Air-Lion, Air-Giant, Air-Tiger, and of course the Air-King. Today, only the Air-King remains. The first true Air-King was introduced in 1945 with the 4925. The 4925 was the follow-on to the 4365 series of "Air" models. For the international market the progression was from the 4925/4365 (sub-seconds), 4499, 6552, 5500, 14000, 14000m, then finally the super cased 114200. In 1958, however, a separate line evolved independently for specific markets. These included the Air-King-Date and the 550X models for the Commonwealth market. At the same time the 5504 Explorer 35mm case was used for the Air-King as well. This reference being the only 35mm Air-King to date. To make matters more complex, the 5500 case was used for both the Air-King and Explorer. This, of course, isn't the end of the Air-King/Explorer connection but for the sake of clarity we will leave that for another discussion. The models preceding the 5500, with the exception of the 6552, used Hunter movements. 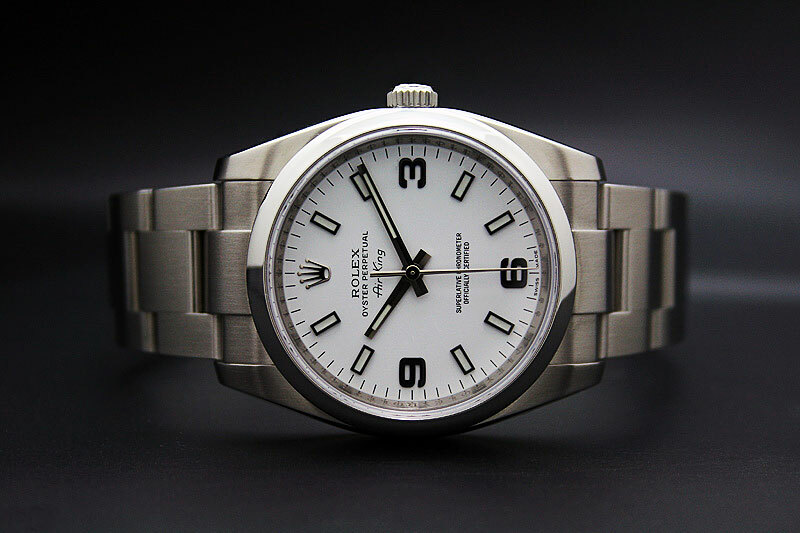 Rolex continuously issued new reference numbers as they refined the Air-King line. The 6552, introduced in 1953, can be considered a transitional model to the 5500 as they appear very similar. The 5500 was introduced in 1957 and used a caliber 1520 or 1530 movement but due to import laws, the jewels were reduced in the 1520. The 1520 was either 17 (US market) or 26 jewels. The 1530 had 17, 25 or 26 jewel variants. The movement type was denoted on the dial with the text Precision or no text for the 1520 and Super Precision for the 1530. Many dials were used during the long 37 year production run. Today, some are extremely rare, including the double red. This dial was an early production dial with the words Air-King and Super Precision in red. After the 5500s long and mostly unchanged 37 year run, the Air-King line was upgraded to a sapphire crystal and new cal 3000 movement. This new Air-King was rechristened with the reference number 14000. Refreshed versions of the 5500 dials carried on with new 3/6/9 Explorer style dials following shortly after. This reference also marked the introduction of the engine turned bezel , reference 14010. The 14000 series received the cal 3130 movement in 2000 and the change was noted in the reference number with the letter M for Modified. The 14000 series gave way to the 1142XX in 2007. This reference series was a full face lift for the AirKing. New concentric dials were added, the case became thicker at the lugs, and a brand new machined Oyster bracelet replaced the 78350. The engine turned bezel was retained but dropped only a couple of years later. A white gold fluted bezel became an option for the first time. Also, the 1142XX was the first Air-King to receive COSC certification. These changes took the Air-King line firmly into the modern Rolex range before most of the more famous Rolex cousins such as the Submariner. 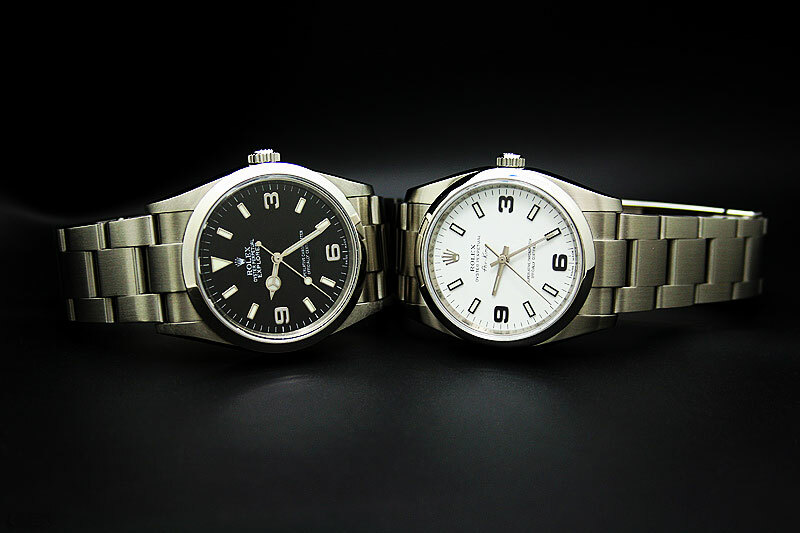 The photo below shows a modern Rolex Air-King with a 34mm white dial side by side with a standard black dial 36mm Rolex Explorer.